Six of these raced each other over class and distance on December 23rd. (3) LIVINGSTONE came home the best of them that day in 2nd place, a length ahead of (8) L CHOICE in 3rd. Those two could well be fighting it out for top honours this time. On the same day but in a different race, (11) RAISING ANGEL raced greenly but still did enough to win. She’s up in class but should be competitive. As should (7) FIRENZE HILL, who also steps up in level following her maiden win a month ago. (2) BLUE ANNA, 4th behind Livingstone and L Choice in that race just before Christmas, looks best of the rest although (9) MATCH QUEEN can have a line drawn through her latest effort and can be a factor too. Only two of the twelve have raced before and (7) RAON STORM raced rather well, leading for much of the way around on December 2nd, ultimately finishing 2nd in a fast-run race. That experience should serve him well here and he is the one to beat. As for the first-timers, (9) PRIME QUEEN was a trial winner and will be well-supported first-up with Moon Se Young aboard, while (6) YULONG FLYING also caught the eye in heats. (2) GEUM ROYAL and (3) SIMJANGUI GODONG are others who could go well first-up. Three-year-old maidens here with four of the twelve racing for the first time. (1) SUN OF THUNDER ran 5th on debut in November and then improved to 2nd on reappearance just before Christmas, the latter over 1300M. He drops back to the minimum here and should have too much. (8) MUNG CHI put in a decent effort in 5th on her debut a month ago and can build on that here while (6) TANTAN WINNER was slightly disappointing on his second start but had previously shown promise first-up and can be given another chance here. Among the debut-makers, (4) GEUMA INVINCIBLE’s trial time was slow but the performance was good enough and he will be expected to hold his own. (5) VALLEY QUEEN too is another to keep an eye on. (3) HAENGBOK STAR and (8) ARES THUNDER came home 3rd and 4th when they raced each other at class and distance on December 23rd. They both look nicely in here to challenge again with Haengbok Star marginally favoured to prevail. The one they’ll both need to beat is (2) HANEULEUL DALRIDA. He ran well for 5th in a stiff 1300M contest last month and tackles this distance for the first time today. It may well suit and he’s likely to be ridden forward. (5) TAEPUNG EYES and (7) KAILASH DANCER are others who can come under consideration. (2) BURUI GORI comes in following two consecutive wins, both at this distance and the most recent at this class. With an apprentice on board, he’s nicely weighted and the only concern is he comes in after twelve weeks out and may need this run. The big danger is (8) GEUMA KINGDOM. He’s never been worse than 3rd in five starts to date and enters having finished in that position in a strong contest at 1300M just before Christmas. He’s up to this trip for the first time today and looks to have good potential. (9) EAST KWAENAM too is up in trip for the first time – he beat a couple of these over 1300M last start, and the extra distance may benefit. (10) MAJJABEUN SON is a two-time winner at this trip and must be respected while (11) MR. TURNER, a maiden after twelve attempts, enters with recent form reading well and can go close. (11) SAMBA RHYTHM was a six-length winner over this distance on what was just her second start on December 30th. She’s up in class today but looks to have more to come and she can win this all-filly event. (8) RAON ARES is also up in class after getting her maiden win three weeks ago. It was at 1000M, but she has previous experience of this distance and has a chance here. (2) HWANSANG DOKJU has had an interrupted career so far but returned from six months off to run 2nd over 1000M at the end of last year. She should be on pace early and can be dangerous. (9) KEEP GOING remains a maiden but comes in off consecutive 3rd place finishes and can match those today while her stablemate (12) DANCING VICAR is another one with placing hopes. (10) GLOBAL CHUKJE is a winner of two from three so far and is up in class and distance following a sharp win over 1300M last time. He hasn’t been close to being favourite in any of those outings but he will be today and he should be winning. (4) KING POSE is a class and distance winner already and while he only managed 5th under today’s weight last start, he looks to be the main rival here. 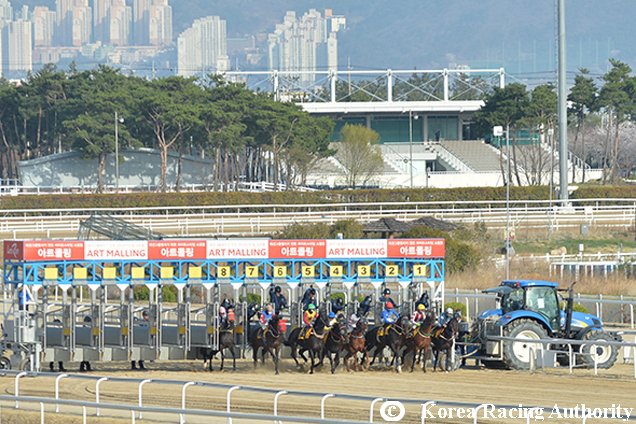 (7) RULES ICHEON is also a winner at the distance having prevailed at class 5 last month. He was an also-ran in the Breeders’ Cup, Korea’s top juvenile race a month prior, and looks to have plenty of potential. (2) JUMBO CAPTAN and (5) HIN BYEOL, both tackling the trip for the first time, are others who should be in the frame. (11) MALIBU TAEYANG finished 3rd on debut in what was a tight three-way finish in a similar strength race to this at class and distance on December 14th. He should have come on for that run and despite being drawn wide once more, can make his breakthrough here. (7) KING THE ROAD was also narrowly beaten when 2nd on her first try at this level last month. She’s another who should be on the early pace and has every chance of returning to the winner’s circle here. (3) GEUMSUYA has been getting closer across four outings to date and can continue to progress here. (1) CHIEF TIME and (4) CEEYOUDOWNTHETRACK are others who can at least challenge for places. (3) RAPIDOCUS won his first two starts in facile fashion in October and November to get rapidly promoted to this class. He was sent off as hot favourite for his first try at this level, but he was also stepped up to 1700M and only managed to finish 3rd. Dropped back in trip today, he has every chance of returning to winning ways. The main danger looks to be (2) HEUNG OREUM. She’s won three of her last five and was a solid class and distance winner last time out. Both should be close to the front from the start and should battle it out to the line. (7) JEWANGUI BYEOL ran a good 2nd on his first try at this class on December 16th and can compete for at least the places again. (9) MALAKAS and (10) GONG SAN are others with claims on the money. (4) MIGHTY POWER ran 4th in the Breeders’ Cup race over 1400M in early December before dropping back to 1000M to finish 2nd on his first try at this level four weeks ago. He’s won at a mile already and he should have too much here under a nice light weight. (2) YEONGGWANGUI FIGHT was an also-ran in that Breeders’ Cup and in the Gimhae Mayor’s Cup, another top juvenile race that preceded it. He had previously recorded two very good victories though and should be happier amongst the more amenable company today, even though he is trying the distance for the first time. (10) BLACK TEN and (11) JANGSAN JOY are both up in class following good victories in their respective latest starts, the latter’s coming at this distance. (7) GAMUNUI YEONGGWANG looks best of the rest. Five of these raced each other over 1300M on December 23rd with (8) MR. FORTUNE running out a shock winner at odds of 65/1. A repeat can’t be ruled out although the extra weight is not in his favour and the runner-up that day (6) WILD DRAGON has every chance of overturning that form. He had won his previous three and was only beaten a length and should go well on his first try at this distance, likely leading from the start. The one to beat though is (5) MENI BLADE. She’s up in class having won her latest two and four from seven in total and while she’s not a fast starter, she may be too strong late on. (12) LUCKY ROOKIE has finished 3rd in both tries at this class so far and steps back in distance with firm claims on a place. (1) KING PLUCKY ran a good 2nd over 1200M last time and can aim or the places again while (2) ROAD KING drops back in trip having bled in December and can improve. (8) BABEL DREAM races for the first time since running a good 2nd in the Gyeongnam Do Min Ilbo Cup back in November having previously scored a fast maiden win at 1000M a month earlier. It’s his first time at 1400M but if he can get a fast start, he’ll be difficult to overhaul. (11) YES PERFECT finished 6th behind Babel Dream on debut before scoring his maiden win three weeks later at 1300M. He returns for the first time in nine weeks and is a big danger. Since returning from five months out, (10) SMART PRINCE has won two in a row, at 1300M and 1800M, the latter four weeks ago. If he’s ridden patiently, a third is not impossible. (1) CHROME MAGIC and (4) PRIME RACE are others who can go close. The first Listed race of the year is a competitive one. Last year’s Derby runner-up (5) MASK is the one to beat. It’s been a long time since he raced at so short a distance, but he finished off his three-year-old campaign well and can kick off his year in style. It won’t be easy though. (12) GASOKBULPAE surprised many when 3rd in the Grand Prix over 2000M in November but it’s as a sprinter he’s best known and rounded out the year by running a close 2nd to Gaon Champ in the Trainers’ Cup. It’s only the wide draw that stops him being top choice but if he can get around and on pace, he can win. (7) CHEONJI STORM was 3rd in this race last year before going on to win a bigger one a couple of months later at the same distance. He’ll be a threat this year as well. (1) SINUI MYEONGRYEONG can get on speed from the inside gate and will be dangerous. (10) CITY STAR has had plenty of setbacks but was 2nd in this race last year and returning from ten weeks off, is the wildcard. (12) CALL UP THE GUARD was a winner at class and distance on December 30th with three of his rivals here behind him. That was his third win in eight starts and while he does carry an additional 3.5 kg today, he is capable of winning again. (10) BLUE FLAG came home 2nd that day and she looks to be the main danger once more. Prior to that race, her previous three starts had all been in Stakes company and she has a significant weight advantage today. (3) CATCH NINE and (7) AMERICAN POWER came home 3rd and 4th when they raced each other at class and distance on December 14th. Both can be dangerous here with Catch Nine the most likely to challenge the favourites. (4) HIDDDEN CHAMP was on the Triple Crown trail last year and returns to action after three months off. It’s a fresh start today and he has plenty of ability. (1) FLYING MUNNING remains a maiden after eleven attempts but has only been outside the top four on two occasions. He comes in having beaten a number of these in recent starts and today really should be his day. Should he come up short once more, there are a couple who could take advantage. (6) MEGALIOS won back to back races over 1700M in October and November to get promoted to this class and ran 3rd on his first try at the level last month. He’s up to 1800M for the first time and will be a danger. (12) MAGICAL CHOICE has only raced twice but was a good winner over 1300M on December 16th. He’s up in class and significantly in distance but the Flat Out colt shouldn’t be ruled out. (8) LEGEND KING and (11) CHUKACHUKA are others who can get close. (6) GLOBAL CAPTAIN is three for three and up in trip to seven furlongs as he tackles class 2 opposition for the first time. He looks to have plenty of potential for more and can maintain his 100% record here. (7) ULTRA PUNCH’s only defeat so far came in the Nonghyup Chairman’s Trophy in November and he was a fine winner over 1200M just before Christmas at class 3. He too is up in class and distance and will be a real threat. (2) THANK YOU CHARLIE races for the first time since that Nonghyup and is another with potential. They’ll need to beat (8) MALIBU BULPAE, a class and distance winner on December 9th. In ten starts he’s never been sent off at odds in excess of 6/1 and that’s likely to continue here. (12) GLOBAL LINE came from off the pace to run a strong 2nd on December 23rd and is another who can go close.